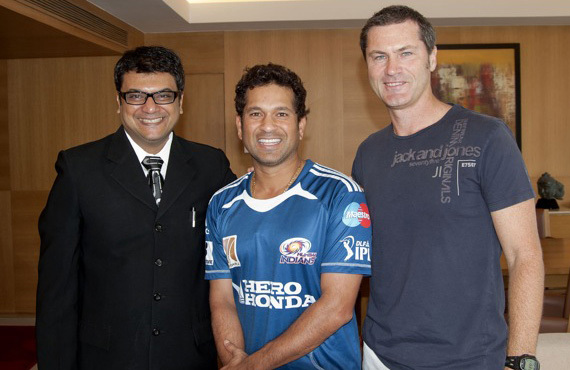 Guest Post by Simon Taufel: Arrival at IPL4 – Mumbai, 08.05.11 | The International Cricket Hall of Fame. First of all, Happy Mother’s day to Helen and all the hard working, loving mothers! Hope you have a great day and are spoiled by your families. The last week in Mumbai has been a productive and rewarding one. It started on the day a week ago when news broke that Bin Laden was found and killed – a day in history that few will forget and I cannot believe that it was almost 10 years since 9/11. I was allocated a nice room at the Trident hotel, a corner room on the 30th floor and it seems luxury to have two windows in your room (which is better than the normal 4 walls). I’ve spent my days off going to the gym, doing some personal training and writing some umpire training modules. My first match in Mumbai was on the 4th of May at DY Patel Stadium in Navi Mumbai. This ground is not close to the hotel where we are staying at it took just under 2 hours to get through the traffic and get to the game. We left at 5pm for the game that was scheduled to start at 8pm with home team Pune Warriors playing against the Mumbai Indians. Any game these days involving Sachin Tendulkar is very popular and almost guarantees a full house. This was no exception. I was asked prior to the game starting to carry a microphone and ear piece to be able to talk to the commentators and obliged. The opportunity was used sparingly by the director but long enough to find an advocate in Simon Doull and a critic in Brad Hogg – we had a few laughs though along the way. Mumbai batted first and set a competitive score of 161 off their 20 overs with Pollard a couple of massive sixes. Yuvraj Singh’s Pune Warriors were not up to the chase and had only cracked the 50 run mark with 10 overs bowled and ended up losing by 21 runs. The match finished at 11.40pm and given the ground location, we ended up getting back to the hotel around 1.30am. The next day was a late start for me and a pretty lazy day after the late night. I was invited to lunch by Doctor Avanish Rajan at his family home – this is a doctor I had met back in 2005 during a Test match in Mumbai and he saved my life (well, almost) when I was suffering from a bad gastro virus. His wife made a very nice and “hot spice free” lunch for us. His son Priyank invited some of his university friends over for a chat and some photos. On the way back to the hotel, we stopped off at the old house in Mumbai (“Mani Bhavan”) where Ghandiji stayed and worked while in Mumbai. Its library boasts over 50,000 books on Ghandian thought and allied subjects. A special man and a special place. Saturday the 7th was match day, but it was also a chance to fulfill the dream of Priyank and his father when I was able to have them meet their hero Sachin Tendulkar at the hotel. To his great credit, Sachin was very obliging to the request and we were able to have the family meet Sachin in his hotel room. A few photos were taken to remember the occasion by and a couple of autographs for the daughters. Even on match day, Sachin has time to spare for his fans – a great role model for any cricketer on or off the field. As the match, it was a blockbuster between the Tendulkar led Mumbai Indians and the Delhi led Sehwag – both players extremely popular here in India. A sellout crowd greeted Hariharan and I as we walked to the wickets at Wankhede Stadium (where the CWC Final was played). Mumbai batted first and as Sachin was opening the batting, we had no chance of hearing anything – not a thing. David Warner from the Delhi side could not believe the noise and we joked about the senseless efforts of trying to have a chat. Mumbai scored a good total of 4/178 as they took Morne Morkel to the cleaners (1/49 off 4 overs). Delhi started very poorly and lost 4 wickets inside the first 3 overs – needless to say…the crowd was going wild and I was in need of plenty of aspirin. Delhi fell short by 32 runs and we finished the match around 11.30pm but did not get back to the hotel until 1am due to having to do some paperwork with Malinga being reported for bowling two beamers in the innings. (The first of which nearly killed Agarkar). I got to bed around 2am and then got up around 8am to start packing and have some breakfast ahead of flying back to Jaipur for the next match on Monday night. The show rolls on! Inside the juggernaut – Simon Taufel on umpiring big cricket. Australian cricket umpire Simon Taufel has kindly agreed for the Museum to publish his blogs from major world tournaments. Featuring unique insights into the challenges and rewards of touring and umpiring at the top level, the Museum gratefully acknowledges Simon’s permission to reproduce his work.